Uni-Pants Support Kit™ has been designed for use with IRONWEAR ™’s new Uni-Pants™ to provide additional support for athletes with small waist and hips, to expand the belt and add extra padding and support for larger waists, to reduce stress and weight on the waist, and to allow the Uni-Pants™ to be connected to external resistance devices for pulling and jump training. Uni-Pants™ revolutionary new patented design includes 6 connection tabs around the belt. These tabs have been engineered for the connection of other support and resistance devices. Uni-Pants Support Kit™ includes 6 connection rings, adjustable suspenders with shoulder pads, and a waist expander pad. Uni-Pants Support Kit™ 6 connection rings can be easily inserted or replaced in the connection tabs. The ring are medium weight for general use, Some applications may require stronger connectors. Uni-Pants Support Kit™ unique adjustable suspenders include shoulders pads with a heavy elastic section to allow for bending, and an oversized length adjusters with quick release attachment hooks. 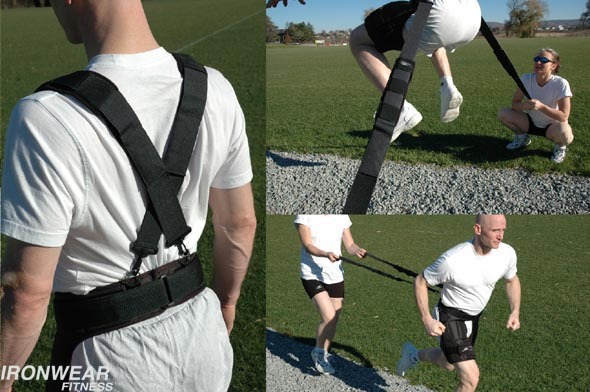 The suspenders reduce the weight on the users waist and are a valuable tool for intense workouts. Uni-Pants Support Kit™ expander pad attaches to the back of the belt and increases the maximum size of the Uni-Pants ™ and provides padding over the spine. Uni-Pants Support Kit™ make it possible to do a wide variety of resistance trainings with the 6 different connection points around the waist. Right and left points for forward pulling, right and left point for backward pulling and right and left side points for vertical jump and side resistance. Uni-Pants Support Kit™ provides more training options that any other system and is a great accessory for the Uni-Pants™ .